We're having a Meet Up here in New York City at the Gizmodo Gallery and we'd like for you to come! Unless you are terrible. Don't come if you are terrible. Or at least bring a gift for me. I like whisky. Okay! 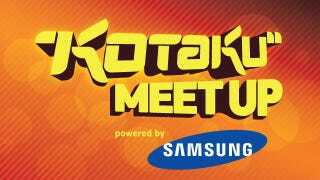 The first 100 readers to RSVP to meetup@kotaku.com with subject line 'Kotaku Meetup December' will be able to attend. We're booked up! You'll be able to play the Diablo 3 beta on Samsung's 950 Series 3D LED Monitors. When & Where: Thursday December 8th, 9-11 pm, 329 Broome St.